Montreal Canadiens forward Rene Bourque cleared waivers Monday and was sent down to the Hamilton Bulldogs of the American Hockey League. "It's not a question of confidence. 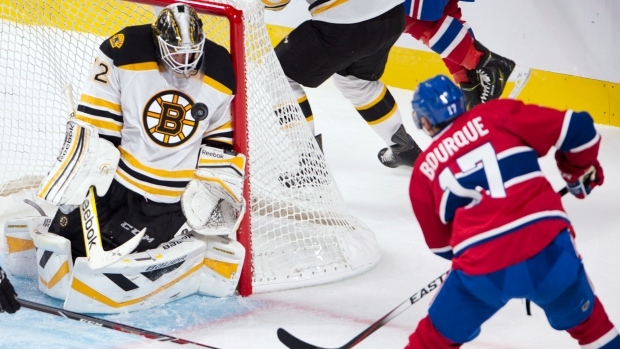 It's all about results," said head coach Michel Therrien about the move. In 13 games this season, the 32-year-old Bourque has two assists with a plus-minus rating of minus 9. He was placed on waivers Sunday. The Lac La Biche, Alta. native had an impressive playoff last spring netting eight goals and three assists in 17 games. The Canadiens acquired Bourque from the Calgary Flames in exchange for forward Mike Cammalleri, goaltender Karri Ramo and a fifth-round draft pick during the 2011-12 season.